Ion Staunton, the entomologist who designed the DIY Termite Trap has built on the original version to present a more effective termite monitoring system for greater value and ease of use. 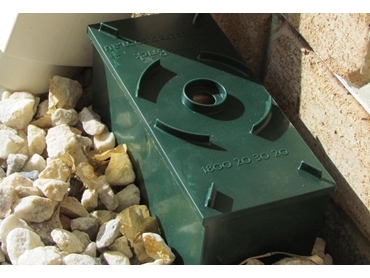 The original TermiteTrap system continues to protect thousands of Australian homes even today. Basing his new design on the reasoning that termites still find their food above ground level, Ion has introduced the new DIY TermiteTrap termite monitors to deliver several benefits to the user including easy installation, inspection and bait addition as well as simple maintenance and long-term protection. Property owners can now get 22 traps in a single carton to help them protect the entire area. A higher number of traps ensure greater coverage and protection to the property. Delivering superior value for money, ease of use and long-term protection, DIY TermiteTrap termite monitors consist of UV-resistant plastic bricks with timber inside, which can be replaced with fresh timber after successful baiting. Termite problems can be managed efficiently using monitors and baits, and through regular inspection of the home and property.